Climate-change-wisdom tries to gather clear, simple and (hopefully) unbiased information on the climate change conundrum. We try to help you unravel the issues and separate the spin from the facts. If there is still an issue you can't fathom, the solution is here. On this page you can ask a question on any climate change, global warming or environmental topic you like. We will try to provide an answer that will help you make up your own mind. Think of a topic for your question. It need not be specific or clever, just two or three words that covers the topic of your question. Examples of topics would be climate change, global warming, carbon price, carbon tax, climate warming, environment, or any other theme you think your question relates to. Enter your topic in the first box. Enter your full question in the second box. Ask your question in your own words. Include, where you can, an bit of an explanation for your question. Often a description of the reason why we are curious or confused about something is a big part of finding the answer that works. Please include where you can any explanations or extra details as to why you want an answer. This not only helps Climate change wisdom to find the best answer for you, it also gives background that other readers would find useful. Whatever the reason, jot down some thoughts to support your question. No need for an essay just a couple of lines is fine. Once you submit your question we will provide an answer that will appear below your question on a new Climate change wisdom page. Your question and the answer help other visitors gain understanding. You are also able to rate and comment on the answer when you next visit the page. Climate change wisdom will moderate comments to ensure they are wholesome, healthy and constructive. But this is contentious stuff, so there may well be disagreement. This will be good too so long as the opinions of others are respected. In the end it is informed choice that matters most. Your question, description and an answer from CCW will appear on a Web page exactly the way you enter it here. You can wrap a word in square brackets to make it appear bold. For example [my question] would show as my question on the Web page containing your question. what is anthropometric induced climate change? Climate change wisdom will add an answer below your question and post both as a new webpage on the Climate change wisdom website. We will try to make the answer as objective as possible. Climate Change Wisdom aspires to be the place where light appears across the big picture. We hope to clear away some of the clutter of sensationalism and fear that helps the mainstream media sell advertising space and let you decide for yourself. If we do show a bias - it can be hard not to sometimes - then there is a comments section on the page that will allow you to tell us where we have strayed. You can also use the comments box if you do not understand the answer. You have the option of email notification when the page goes live. Climate change wisdom will not use your email for any purpose other than notifying you of what has happened with your question. Whenever I can I will answer the question myself. I have been around as a college professor, in the commercial consulting world and on government committees for over 30 years tackling environmental issues of all kinds. My work has covered the environment, soils, biodiversity, wildlife, environmental legislation and most things around natural resource management. You can see a list of projects on the website of my consulting practice alloporus environmental. when I’m stumped Climate Change Wisdom has a network of expert friends who are happy to assist with an answer. DO YOU HAVE A COMMENT RATHER THAN A QUESTION? If you have a comment or a thought on how to improve Climate Change Wisdom we would be delighted to hear from you. DO YOU HAVE A GREAT SUSTAINABILITY IDEA OR CLIMATE CHANGE SOLUTION? If you have a great option for a global warming solution, or maybe a neat sustainability idea that you would like to share you can. Confused Confucius spurned the monastic life for the world of work, moral conundrums and mobile devices. 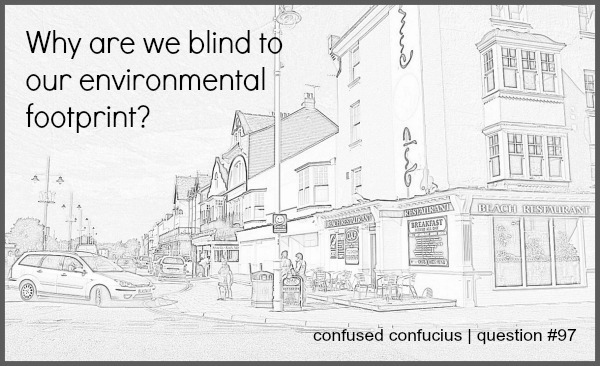 His sayings, questions and incongruous idioms on the environment and modern life bring delight and bafflement in equal measure... check out more Confused Confucius sayings.